Drum Lessons for people of all ages and abilities! Lessons can be taken in the comfort of your own home or at my teaching room in Hilperton near Trowbridge. 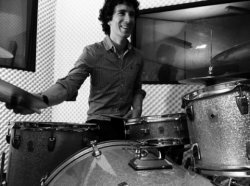 Since graduating from the Academy of Contemporary Music in 2004 I have been touring the world as a session drummer, performing with various artists at some of Europe’s most prestigious festivals and venues including Brixton Academy, The NIA Birmingham, Glastonbury Festival, Shepherds Bush Empire and The Paradiso, Amsterdam. I have toured in support of internationally acclaimed bands and artists, Lynyrd Skynyrd, John Fogerty and Wishbone Ash as well as sharing festival bills with the likes of Feeder, BB King and Jimmy Vaughan. In 2012 and 2013 I was nominated in the Drummer of the Year category at the British Blues Awards following work with Jon Amor Blues Group and Aynsley Lister. My recording career has included sessions at Real World Studios and the BBC’s Maida Vale, working with renowned producers such as Tom Dalgety (Royal Blood) Chris Hughes (Adam and the Ants), Dom Monkes (Paolo Nutini) and Steve Evans (Robert Plant). My drumming can be heard on two albums by the multi award nominated Jon Amor Blues Group (Jon Amor Blues Group 2011 and Villa Del Vibro 2013) as well as the 2010 release ‘Tower Sessions’ by Aynsley Lister. I also appear alongside Robert Plant and Clive Deamer on Jon Amor’s 2007 album ‘Unknown Soldier’. I am proud be an official UK endorsee of Ludwig drums, Los Cabos drum sticks and Protection Racket Cases. I have been teaching drums for 6 years both privately and in local schools. I have gained a great deal of experience teaching students of all ages and abilities. During my teaching career I have done a lot of work with children and adults who have social, behavioural and learning difficulties. For the past four years I have also been running group drumming workshops at a day centre for adults with learning disabilities. I currently teach both privately and in local schools. My aim is to encourage students to have fun and express themselves while learning about different aspects of drumming including, sight reading, improvisation, technical development, musical styles, music theory and all round musicianship. Whether you would like to take your grade exams, improve your technique or if you just want to learn how to play your favourite songs, my lessons are tailored to each individuals ability, goals and aspirations. Students who are interested are also given the opportunity to work towards Drum Grades through the Trinity College, Rock and Pop syllabus or with Rockschool. I also have a current, enhanced DBS check.